“What do you want to be when you grow up?” It’s a common question asked of young children, but we probably don’t put too much thought into how children actually learn about career options available to them. It might sound funny to think of pre-schoolers or even younger school-aged children having to think about a career that might be 20 years down the road, but it’s never too early to plant the seeds of knowledge! When our friends at Workforce WindsorEssex approached us about working with them to create a career resource for parents and teachers, we were excited to be a part of this project. We’ve found that it’s just not an area with lots of readily available information, and we wanted to do our part to change that. That’s where our, ‘Let’s Explore Careers,’ resource page comes in handy! 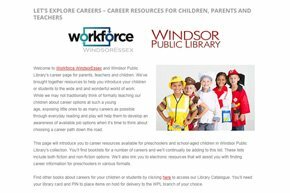 We’ve collaborated with Workforce WindsorEssex to gather booklists, helpful webpages and advice about introducing your pre-schooler to the wonderful world of work. This resource is currently aimed at parents and teachers of the under 5 set, but we look forward to expanding the focus to include older children in the near future. You can access the guide from our webpage by clicking on the ‘Research’ tab and then, ‘Let’s Explore Careers’. Or click here to access it directly.